Make an informed decision about your education by understanding how Middle Tennessee State University's retention and graduation rates impact you. First year retention rates let you know how many students come back for their sophomore year. 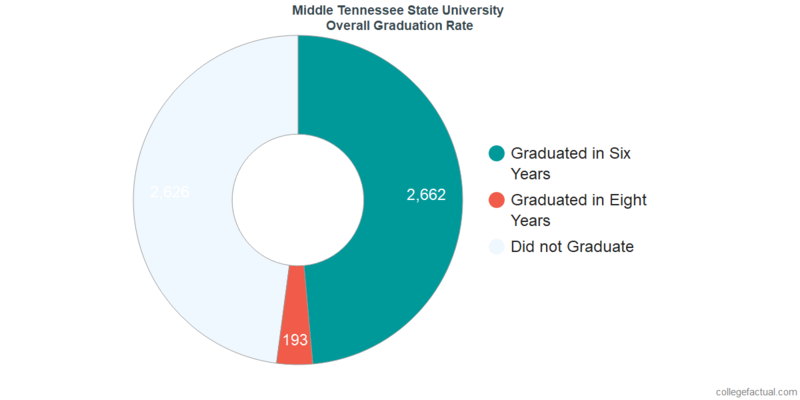 Graduation rates tell you how long it takes to complete a degree at Middle Tennessee State University. Remember, every extra semester it takes to graduate will increase the cost of your degree. 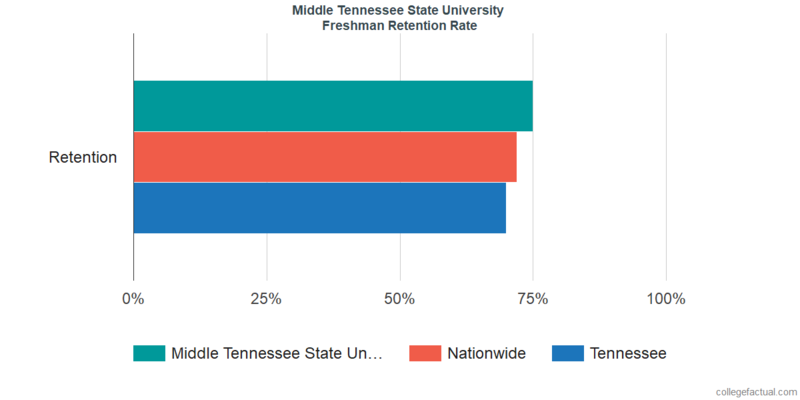 With 75.0% of students making it past their freshman year, Middle Tennessee State University has freshman retention rates similar to the national average. At Middle Tennessee State University, there were 5,481 bachelors degree candidates in the class of 2013. By 2015, six years after beginning their degree, 48.6% of these students had graduated. After an additional two years, 52.1% of this class eventually completed their degree. This implies that 47.9% did not graduate within eight years. 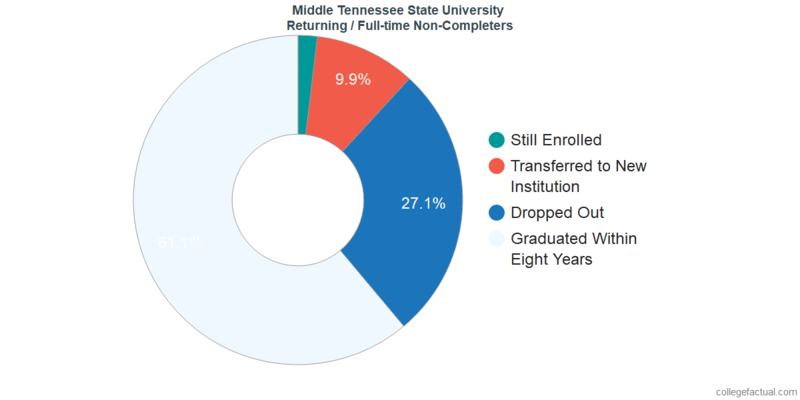 Of these 2,627 students, 106 were still working towards their degree, 768 had transferred to a different institution, and Middle Tennessee State University lost contact with the remaining 1,752 whom we assume dropped out. First-Time / Full-time Students at Middle Tennessee State University Represent 63.3% of the Class of 2013 and 60.9% of all Their Bachelor's Degree Graduations. 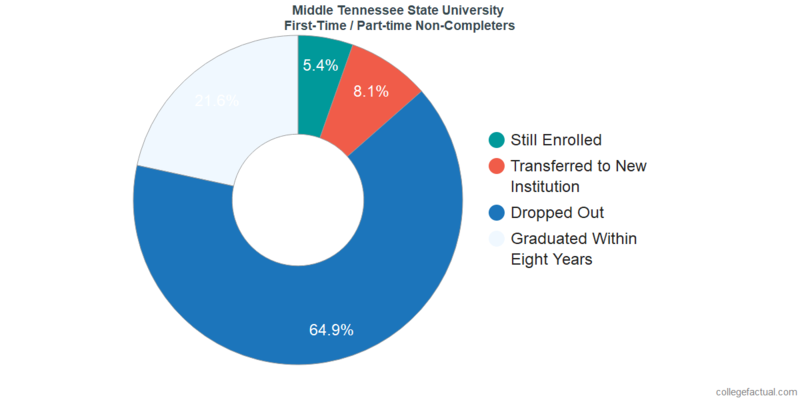 With a four year graduation rate of 20.0%, first-time students in the Middle Tennessee State University class of 2013 who attended classes full-time were less likely than average to graduate on time. After six years, the graduation rate was 46.2% and by 2017, 50.1% of this class had completed their degree. Studies have shown that high-achieving students are more likely to complete their degree on time. 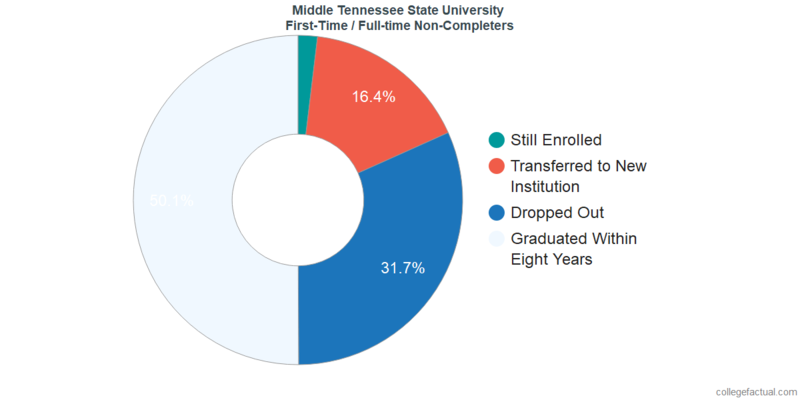 Given the academic preparedness of the first-time / full-time students accepted to Middle Tennessee State University, we expected that after six years about 52.4% of them would have completed their undergraduate degree. 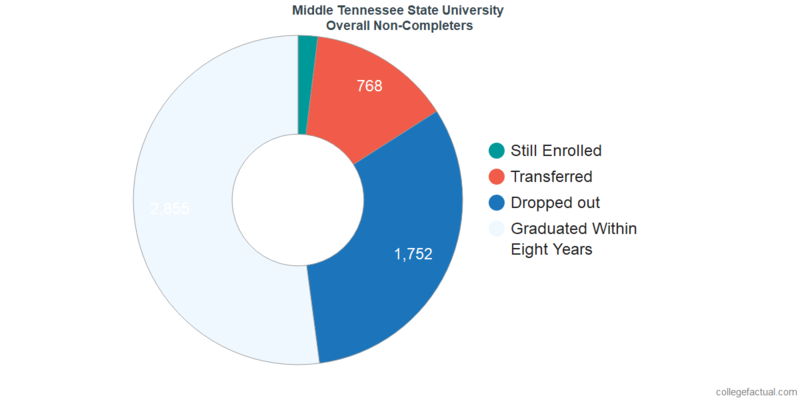 Of these 1,734 students, 66 were still working towards their degree, 569 had transferred to a different institution, and Middle Tennessee State University lost contact with the remaining 1,099 whom we assume dropped out. 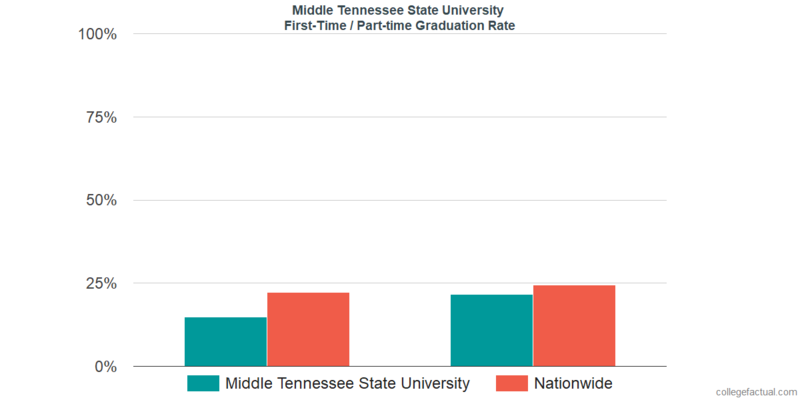 First-Time / Part-time Students at Middle Tennessee State University Represent 1.4% of the Class of 2013 and 0.6% of all Their Bachelor's Degree Graduations. 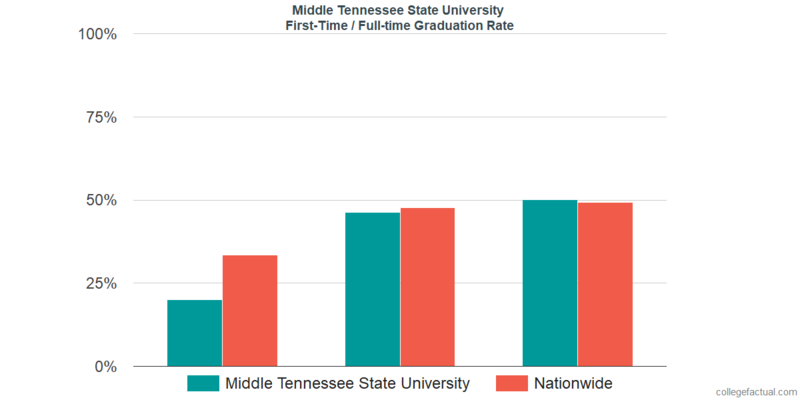 With a six year graduation rate of 14.9%, first-time students in the Middle Tennessee State University class of 2013 who attended classes part-time had a graduation rate similar to the national average. After eight years, the graduation rate was 21.6%. Of these 58 students, 4 were still working towards their degree, 6 had transferred to a different institution, and Middle Tennessee State University lost contact with the remaining 48 whom we assume dropped out. 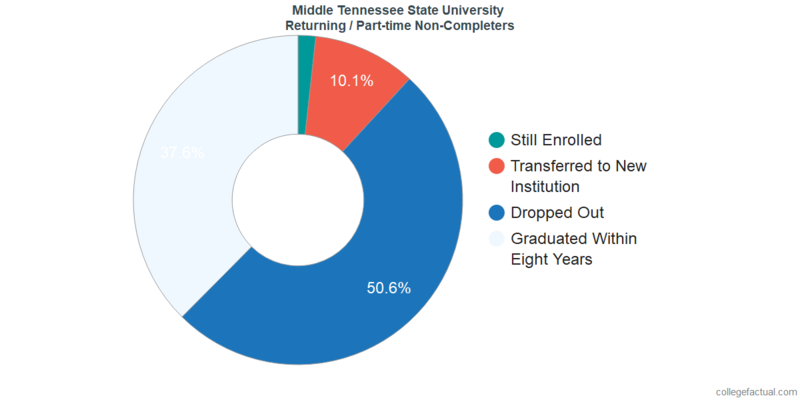 Returning / Full-time Students at Middle Tennessee State University Represent 29.0% of the Class of 2013 and 34.0% of all Their Bachelor's Degree Graduations. With a six year graduation rate of 58.3%, returning students in the Middle Tennessee State University class of 2013 who attended classes full-time had a graduation rate similar to the national average. After eight years, the graduation rate was 61.1%. Of these 618 students, 30 were still working towards their degree, 158 had transferred to a different institution, and Middle Tennessee State University lost contact with the remaining 430 whom we assume dropped out. 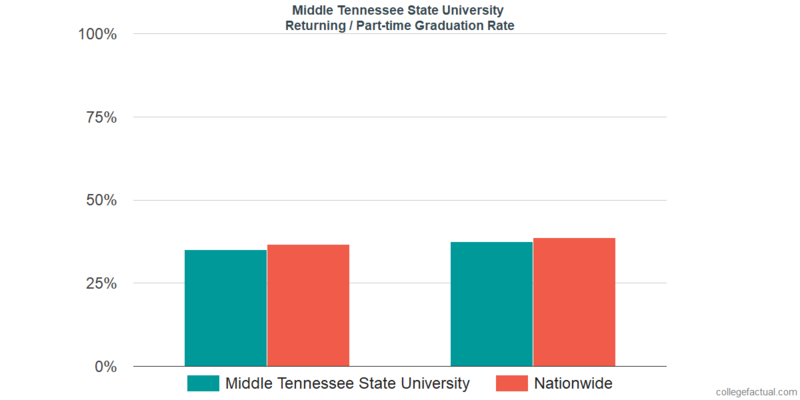 Returning / Part-time Students at Middle Tennessee State University Represent 6.3% of the Class of 2013 and 4.6% of all Their Bachelor's Degree Graduations. 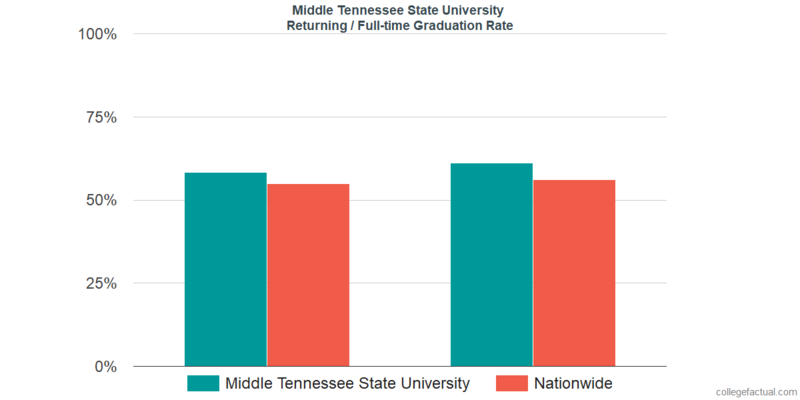 With a six year graduation rate of 35.0%, returning students in the Middle Tennessee State University class of 2013 who attended classes part-time had a graduation rate similar to the national average. After eight years, the graduation rate was 37.6%. Of these 216 students, 6 were still working towards their degree, 35 had transferred to a different institution, and Middle Tennessee State University lost contact with the remaining 175 whom we assume dropped out.